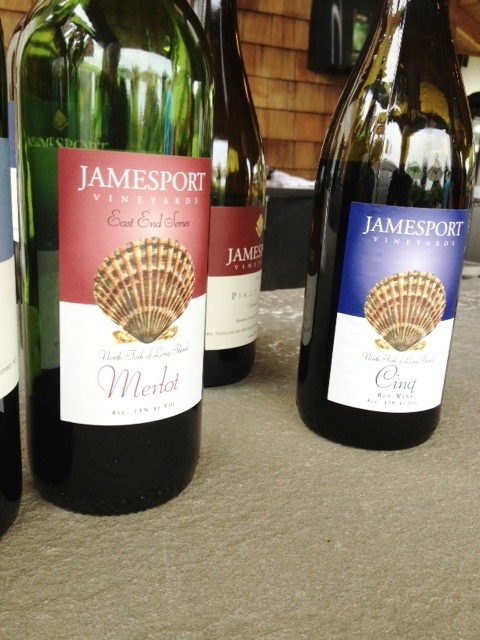 The last time we went to Jamesport Vineyards it had been to simply have a glass of wine and a plate of oysters, not a bad reason to visit as they are very well set up for that (more on the oysters later), but we felt it was time to do a complete tasting. The tasting room is in a 150-year-old barn, and is half bar and half a view through large windows into the wine-making operation. Though the room itself is small they have lots of space outside, and we see large groups immediately ushered to the outdoor space. They have a few t-shirts and other items for sale. Our server presents us with a list, but gives very little additional guidance, so we are left to decide for ourselves what to taste. A tasting is 5 wines for $13, and they have 13 wines in all, so we decide to share two tastings so we can sample 10 of their wines, which are served in attractive round-bottomed glasses. We skip the Rosé, the Pinot Noir, and the East End Cabernet Franc. We also notice that the list of bottles for sale is not exactly the same as the tasting list. Our server informs us that this spends “a little bit” of time in oak and the rest in steel, so it is not too buttery, and she is right, though perhaps it could have used more time in oak, as it is very lemony and tart. The aroma is of wood and spice, and while not unpleasant we find it too citrusy. My high school French reminds me that cinq=five, and indeed, this wine is made from 5 grapes: Chardonnay, Sauvignon Blanc, Riesling, Gewürztraminer, and Pinot Blanc (in unknown proportions). 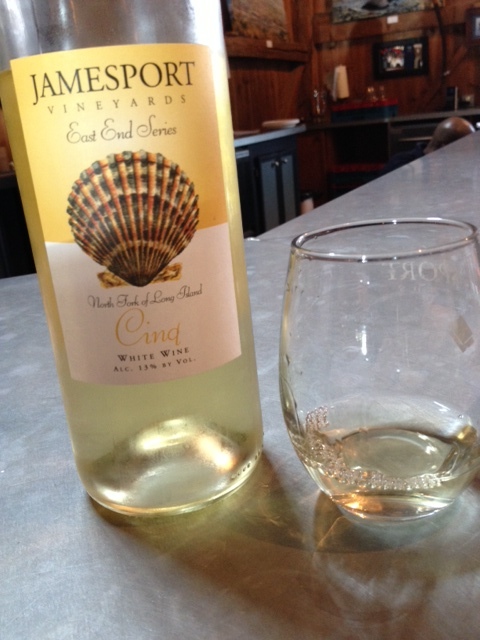 The bottle has an attractive picture of a scallop shell, so we turn it around to read that this wine is made, as they say, “…in partnership with the SPAT (Southold Project in Aquaculture Training) program. This Cornell Cooperative/Community-based partnership encompasses an initiative to teach residents how to raise their own shellfish in the bays of the East End. The large scallop shell on the label pays homage to the bounty of the North Fork’s bays and creeks.” Fittingly, we feel this wine would go very well with local oysters! I detect an aroma of piney woods and a lovely crisp taste of gooseberries with some citrus at the finish. Very buyable! “This is my favorite white,” enthuses our server, and if she likes pineapple that would explain why. We like it too, but not as much as the Cinq, though it would also be good with oysters. An aroma again of pine forest precedes a taste with lots of pineapple, and maybe some pine, too. Off dry? Not really. An aroma of petrol, they say? We say cardamom, and we also say too sweet, and we also say time to dump the rest of the glass. Moving on to the reds, we start with their merlot, which we quite like, also. Aromas of blueberry and cinnamon, tastes of cherry and berry, and no earth means we’re happy. Some tannins, and the end is a bit sour. This is also buyable. We smell minerals and wood, taste some cherry, but it is very dry and has no finish to speak of. Just eh. This is a relatively simple Cab, though with a nice long finish. Some cherry aromas, but not much smell at all, and nicely dry with good fruit. Their Bordeaux blend, this is an amalgam of 49%Cabernet Sauvignon, 25% Merlot, and 26% Cabernet Franc. Although there’s not much aroma, the taste is delicious, like ripe purple plums and what I believe are called “chewy tannins.” Whatever. It’s good! Another blend, and this is a wow: 68%Cabernet Franc, 18% Merlot, 14% Cabernet Sauvignon, 2.5% Syrah, and 2.5% Petit Verdot. Yum. Aroma of dried figs, lots of complex ripe fruit tastes, and a lovely finish. Happy tongue. This would go great with a Porterhouse steak from Wayside Market. 62% Syrah, 18% Cabernet Sauvignon, 9% Cabernet Franc, 9%Merlot, 2% Petit Verdot—They do like their blends here. And justifiably so! This is not as good as the Jubilant, but still really good, with nice tannins , dry, but lots of fruit, with an aroma of cedar and ripe figs. 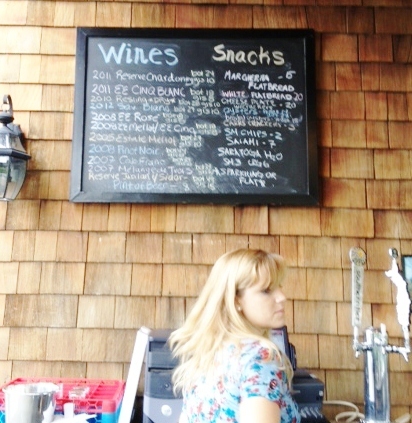 I note one wine on the bottle list which goes for $100, pretty unusual for the North Fork. We pay for our tastings and then move outside to the attractive stone bar, behind which are two people, a drink server and an oyster opener. We get a glass of the Cinq to share for $8 with a plate of a dozen oysters for $22. If you get them, get the cocktail sauce and grated horseradish, not because the oysters need any embellishment, but because both sauces are very good, especially the horseradish. They also offer some beers on tap and Margarita pizzas. 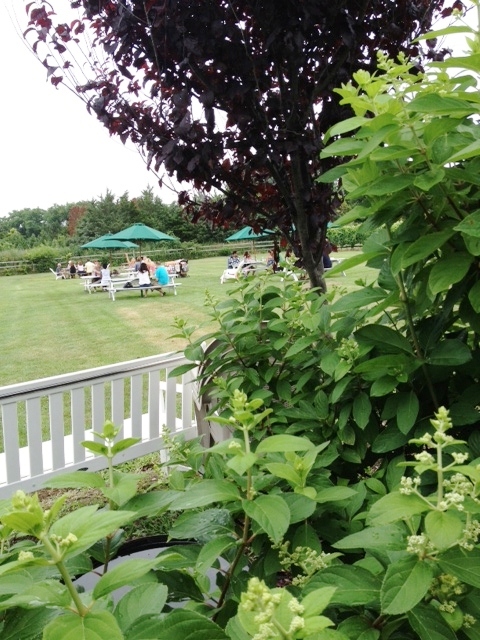 A singer provides entertainment to the various groups scattered around the grounds at picnic tables. We sit on a cushioned bench at a small wooden table across from the bar and enjoy our treat. The oysters a bit small, but very fresh, with lots of liquid, and the wine goes perfectly with them. Reasons to visit: you want to have a glass of wine and a plate of oysters; the East End Cinq Blanc, the East End Merlot, the Mélange de Trois, the Jubilant, and the Sidor; you want to sit outside and listen to music; you want to support SPAT. With all the rain we’ve had recently it may turn out to be really useful that the bar in Jason’s Vineyard is shaped like a ship. To be exact, it is supposed to resemble the Argo, that mythical ship built by the goddess Athena and crewed by all the great warriors of Greece, the Argonauts, led by the hero Jason, on a quest to win the Golden Fleece. It was a heroic quest, and Jason did win the Golden Fleece—with the help of Medea, the king’s daughter—but his story did not end happily, and I’m afraid the same mixture of good and bad applies to Jason’s wines as well. We had been here in 2009, shortly after it opened, and so we were interested to see how the wines had developed since then. Jason Damianos is the son of the owner of Pindar Winery. A tasting costs $7 for 4 tastes, from a menu of twelve, so we opt for two tastings to be shared, enabling us to try 8 of the wines. Jason’s has an interesting system. When you enter you go to the cashier and pre-pay for your tastings, and she then gives you tokens which you turn over to your server one by one as you try each wine. I would guess it helps everyone keep track of what is happening, as I am sometimes amazed at the ability of servers to remember which wine each of five or six customers is up to. The tasting room is a good size, and there is a large roofed porch to one side, where we saw at least one group sharing snacks and glasses of wine. In addition to wine, they sell some wine-related tchotchkes, t-shirts, nuts and other snacks, and we notice Greenport beer on tap. We left before the live entertainment started. Although this is not the first wine on the tasting menu, our server recommends we start with it, as it is their driest white. Aromas of citrus, asparagus, and minerals greet our noses, followed by a sour grapefruit taste. Though this is dryer than any of the whites we tried in 09, the dryness is not balanced by sufficient fruit, and we differ on how unpleasant we think this is. I would drink it, but my husband says he would prefer not to. We could have chosen the 07 Chardonnay, which is also on the menu, and the server says there is really no difference between the two. Both are aged for 9 months in new French oak, and of course have the typical vanilla/woody aroma of an oaked chard. Though the wine is too cold, we warm it in our palms and sip. Not bad. Strongly vanilla, with some flavors of almonds and toast, it would be nice with a creamy double cream cheese. There’s that cat pee aroma. The server describes it as off-dry, but we say sweet. Apricot. Apricot fruit leather! Finally, our quest to taste the first wine on the list is fulfilled! This is a blend of 41% Chardonnay, 24% Seyval Blanc, 20% Cayuga, 9% Vidal Blanc, and 5% Riesling, which we find intriguing, since three of these grapes are not usually grown on Long Island, but instead are found Upstate. After some conferring between the servers, we are told that indeed, all the grapes are grown on Long Island. Well, quests don’t always end happily. The aroma of the wine reminds us of rotted fruit with some wet rock thrown in (like the rock Jason used to make the seed-grown warriors battle each other, perhaps). This is less sweet than the Riesling, with some mid-palate honey tastes, though the finish is a bit tarter. 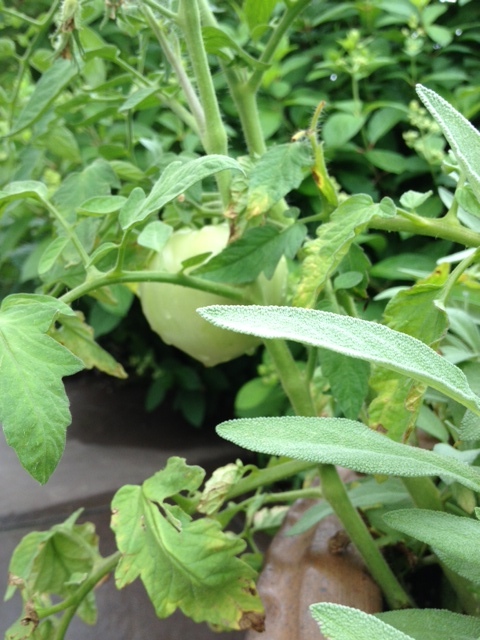 We taste some cantaloupe. Though we like it better than in 09, we find it still too sweet for us. By the way, here they rinse your glass between each taste, not just at the transition from white to red. I used to think this was a good idea, but I’m coming to wonder if the residual water affects the taste of the wine at all! This Merlot and the 06 both spend 24 months in new French oak. We smell the typical earthy aroma of many Long Island reds, with some notes of fig jam. Some ripe fruit flavors, but all in all we’ve had better Merlots. Again, local earth smell, but this one is better. It’s dry, with some nice berry/cherry flavors, ending with a tobacco flavor that reminds me of a dessert we once had in Bologna which was sprinkled with tobacco. Really! There are lots of tannins, and we think this could age well. Our server informs us that this wine generally tastes best if you open it well before you want to drink it and let it aerate. I guess that would dissipate the phenol/chemical aroma we find so unpleasant, but I’m not sure it would improve the taste, which reminds us of sour sucking candy. I NEVER want to drink this, says my husband. Finally, a red we like! Though the aroma reminds us of clothes which have sat too long in the closet, with perhaps some trace of cedar, it tastes pretty good. The first taste is of cherry coke, but it ends nicely dry. This is a sippable red and would also pair well with lamb chops. We skipped the Meritage, which is a blend we’ve tried at other places, and their dessert wine, which is served with a piece of chocolate, and also their lone rosé. 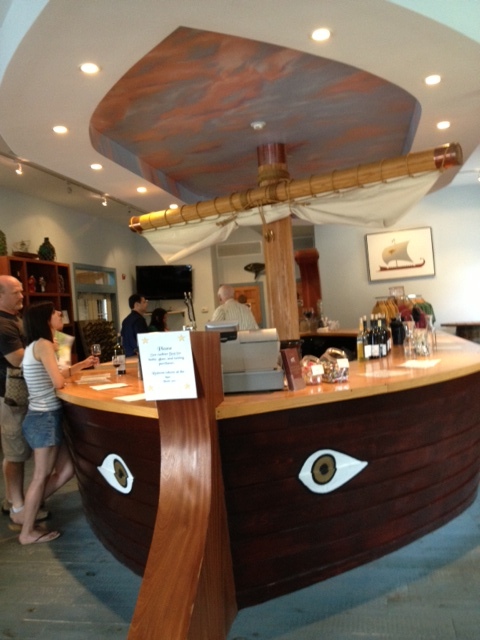 Reasons to visit: You like sweet wines; you want to see a bar shaped like a Greek sailing ship (complete with a furled sail! ); the 08 Chardonnay and the 2010 Malbec.